Normally I wouldn’t give the Chevrolet Captiva the time of day – though there are some good saloons in the Chevvy range – but I sat up and took notice because caravaners have given it an award. In the Caravan Club Awards the Captiva picked up best all-wheel drive over 1800kg category. To win, 10 experts judged its performance against 23 models in its class. The panel of 10 judges included journalists and committee members with tests included a mid-range 30-60mph acceleration assessment, high-speed towing circuits, emergency braking, ride and handling evaluations and hill-stop and restart tests. Now that’s some serious handling and torque performance in demanding circumstances. Chevrolet must know their market because they launched a ‘Safe Towing Guide’ in the summer. This national competition categorised entrants by Vehicle Excise Duty tax brands rather than price for the first time. The Captiva starts at £28,285. 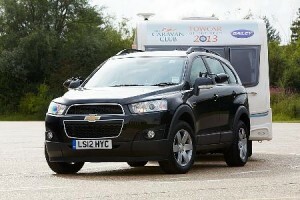 This entry was posted in News and Views and tagged caption, car, chevrolet, Chevrolet Captiva, LS, price, Safe Towing Guide, speed, Vehicle Excise Duty by Steve Lumley. Bookmark the permalink.